Clinical Pastoral Education (CPE) is an opportunity for lay persons, pastors, church leaders and healthcare professionals to get clinical experience as a chaplain in the hospital setting through visitation. It includes the reflective experience using group dynamics with others from different backgrounds and denominations. It is a challenge to go deeper within ourselves and learn and develop skills to go deeper with patients and their families to bring comfort and support to meet their needs. The clinical sites for students will include UnityPoint Health - St. Luke's, Mercy or both hospitals depending on the needs of each student and the needs of the program. Each applicant must have a high school diploma or the equivalent and be in some sort of ministry training, or have been in some type of ministry training. A minimum period of 400 supervised hours; the clinical practice of ministry; detailed reporting and evaluation of ministry; an individual contract for learning; peer group experience and individual consultation. Each student who applies will be considered for an interview by the Clinical Pastoral Education Supervisor and members of the advisory committee. 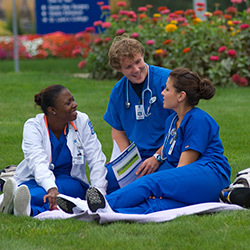 The Clinical Pastoral Education Supervisor and advisory committee members will determine who will be in the program according to their understanding of chaplaincy work in a hospital setting, integration and maturity of developmental issues and ability to fit into the program and expectations set by ACPE guidelines. The following link will take you to the ACPE website where the application process begins: Clinical Pastoral Education Application.